An Accurate Map of the West Indies from the Latest Improvements. 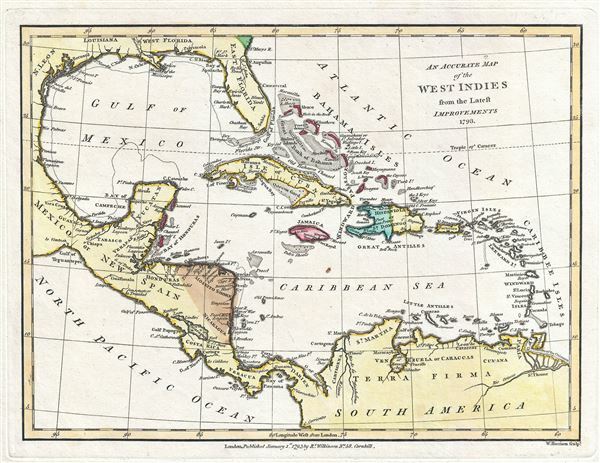 This is a fine 1793 map of the West Indies and the Caribbean by Robert Wilkinson. Wilkinson's map covers the West Indies, from the Mexican Coast to the Windward Islands, inclusive of the Gulf of Mexico, the Caribbean, Central America, Florida, the Spanish Main, the Bahamas, and the Greater Antilles. The tentative British claims in Belize and on the Mosquito Coast, where English buccaneers, pirates, and privateers set up makeshift unofficial colonies from which to raid Spanish treasure fleets, are noted. As this region was highly important to British maritime commercial and military interests, Wilkinson also identifies various shoals and other undersea dangers throughout. The Spanish Main was the point of departure for enormous wealth that was shipped back to Spain in the form of gold, silver, gems, spices, hardwoods, hides and other riches; because of this, the area was ripe territory for pirates and privateers. The late 18th and early 19th century saw a resurgence of privateering as successive colonial powers jostled for supremacy in the region. Though piracy was on the rise throughout the Caribbean, nowhere was it more prevalent than in the Windward Passage, a vital maritime trade artery between Cuba and Santo Domingo. This era gave rise to the French pirates Pierre and Jean Lafitte, among the most successful pirates of all time. This map was engraved by Thomas Conder and issued as plate no. 43 in the 1792 edition of Robert Wilkinson's General Atlas.